Nothing says apres ski in Killington like wings. Or as they’re known in some parts, “wangs”. Regardless of how you slice’em, spice’em or wash’em down, the battle for the Killington Wing King is launching this weekend. The showdown begins Friday 27 January and the winner—based on your votes—will be crowned Saturday 28 January at Charity’s. Taste testing is 3:00 pm – 7:00 pm each day with the final announcement planned for around 8:00 pm on Saturday. 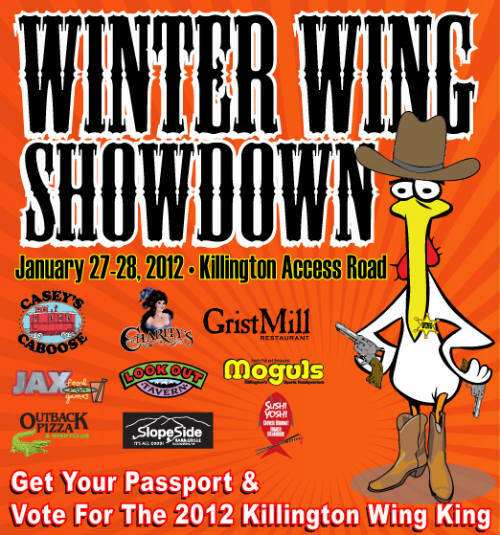 You can grab your Winter Wing Showdown passport and any of these participating restaurants: Casey’s, Charity’s, Grist Mill, Look Out, Mogul’s, Outback Pizza, Slopeside, Sushi Yoshi, and Jax. The party at Charity’s—sponsored by Corona Extra—will feature a rich plethora of giveaways and party favors. If you ever wanted to make history, this weekend is your big chance.